British Home Design Feature: Interior Designer Charlotte Crosland – Design Your Lifestyle. August 2014 Peter Salerno, Inc. If you’re not constantly drawing inspiration from others in your field, then you’re not really growing. Peter Salerno believes that wholeheartedly, and he’s not afraid to let the world know who inspires him. A new favorite artist of Peter Salerno’s is English-based interior designer Charlotte Crosland, whose work was featured in the September 2014 issue of Beautiful Kitchens, the UK’s best-selling kitchen magazine. Proportions are important in a kitchen, especially when it comes to the size of the island in proportion to the room. There are major benefits to an “open-plan” kitchen. Accessibility, an inviting feel, and the space in which to move freely are vital to a functional kitchen. 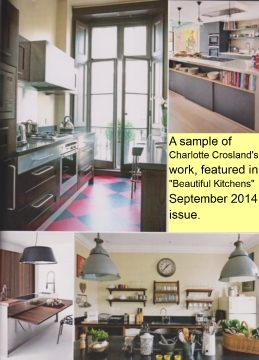 Special thanks to Charlotte Crosland and Beautiful Kitchens magazine for publishing this valuable piece. The September 2014 issue of Beautiful Kitchens is available on newstands and for digital download.